Ahhhh, color ... and so many colors from which to choose! Where do you begin with using color in the garden? What color should you choose first? Why not begin with flowers or plants in your favorite color! By combining your favorite color into your garden site, you'll be able to enjoy it around you every day in the beautiful areas you create. Take into consideration the overall effect you want your color in the garden to have. Your color combinations can set the mood in your flower garden areas. The lighter the colors you use, the more relaxing your garden area will feel. The darker the colors you use, the warmer and more vibrant your garden will appear to be. If you want to be bold, use tints and shades of all one color in a garden area. Throw in a splash of white to accent that single color area or splash in some white to accent any of the beautiful color combinations you choose to put together using these tips. 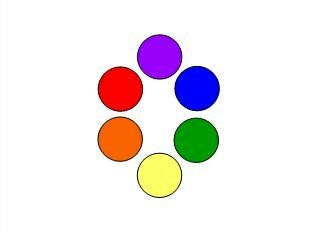 Using the color wheel and these few simple to remember tips, you'll soon be quickly 'n easily combining color beautifully in your garden areas all around you. you might choose to use in your garden, see the links below. *You will need Adobe Reader installed on your computer in order to open the GQnE Color Wheel and Tips. You can get Adobe Reader here (opens a new window). If you want to open the file in your browser window, just click on the link. If you want to download the file and then save it, right-click on the link and choose "Save Target As" or "Save File As." Select where you want to save the file on your hard drive. Once you have saved the file, locate where you saved it, and double click to open.